Michael Jordan Not About The Shoes Motivational Speech - Motivate Amaze Be GREAT: The Motivation and Inspiration for Self-Improvement you need! Michael Jordan is considered to be the greatest basketball player of all time, his achievements are remarkable in any stand point: individual, team wins, impact on the culture, basketball icon for the ages. His sneaker brand (Air Jordan brand) is known for their impact ads, here's one of them "It's Not About the Shoes", containing his powerful words (quotes). "It's not about the shoes..."
- Forget this a shoe ad these are life commandments! It's really not about the shoes! "It's about knowing where you're going, not forgetting where you started." - Extremely important, know where you're going! You must have a direction, a purpose, a goal, a road ahead of you, a path to be taken, Michael Jordan had one. Don't forget where you came from, by humble and give value to everything new you're getting. - Sometimes, people don't get what they want in life because they are afraid of failure. That's one of the biggest fears, fear of not being accepted if you fail, fear of being rejected, not being hold as a perfect person. But guess what? Perfection doesn't exist, so in order to succeed you must be willing to try, even if that means failure. Only the ones of have the courage of trying know what success is. If you don't try you'll get nothing, if you try and fail you'll get experience. Next time around, you'll know what not to do, and what to do, and eventually you'll succeed by the trial/error method. Michael Jordan spent the first 7 years in the NBA ringless, with no team titles, but once he won the first one he never stopped winning. So you must have the courage to step up in order to learn and one day succeed. "Not breaking, when you're broken." - No matter how prepared you are, one day life will break you down, the question is how you will react when bad times arrive. Will you let yourself go down, or will you get up and keep on going? That's crucial, the advice here is: no matter what happens, keep up your faith in you and don't stop! "Taking everything you've been given, and make it something better." 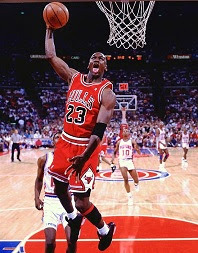 - Michael Jordan advises you to raise the standards, be the best you can be. That means transforming what's good into excellent, don't be happy with average, search the best for you, challenge yourself to achieve new levels. Grow every day. "It's about work before glory, and what's inside of you." - Hard work pays off, and that's more important than thinking about glory or recognition. In time those things will come, but without the hard work nothing will come. Work on your craft, become better, become a better you, search inside of you, be active in your personal development. It's the hours that you put in when nobody is watching you, but yourself, that count! - People will doubt you and your capabilities. They won't believe that you can achieve something unique. Some of them will try to bring you down, because you're actually doing what they wish they could. You must not stop, if they say you can't, you must say to yourself "Yes I Can!!! ", and with determination and will you'll go and do it. That's a challenge and also a motivation, let their negative words be the spark that fires you to excel. "It's not about the shoes, it's about what you do in them." - Having prestigious resources it's good, and in today's world everything it's easier and less complex because of them. But if you don't have the essential, resources will do you no good. If you want to jump higher it's not a pair or Air Jordan sneakers that will do the trick, you have to train hard and be discipline, at the same time, it's not a new pc that will make you a writer, it's your thinking process, your writing skills, etc. You can have the resources but you have to make a good use of them. "It's about being who you are born to be." If you enjoyed this great speech from Michael Jordan as a motivational speaker, please share this article with your friends and family so they too can get inspired to excel!